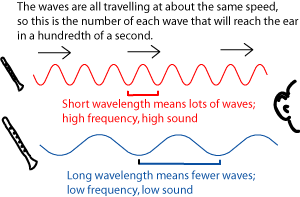 Sound is a longitudinal wave caused by vibrations in matter. When we speak, we are making the air molecules around out voice box vibrate and these make those near them vibrate. Sound is passed along as this wave of vibrations until it reaches your ear. Because the vibrations will be passed along quicker if the particles are closer together, sound travels better through a solid than a liquid. That's why native americans put their ears on the ground to listen for horses in western films! Have a look at the clip on the right to see what happens to sound as the number of air particles around an alarm clock decreases until it reaches a vacuum. You can change the volume of a sound by changing its amplitude: a loud sound has a large amplitude and a quiet sound has a small amplitude. 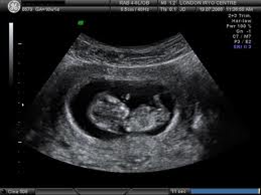 Ultrasound is a high frequency sound wave above the human hearing level. We can use it to create images of inside the body, like the one to the right. At each boundary or change of medium (for example when we change from skin to muscle to placenta to umbilical fluid to baby) some of the waves are reflected back as echos. The time between the echos is measured and used to build a picture. Because sound travels at different speeds through different mediums, you can use its travel time to see if organs are working properly e.g. if there is too much water in a kidney. Ultrasound can also be used to shake apart kidney stones and unwanted growths and is a great alternative to surgery. Bats use ultrasound for echo location.